Halo Power-Trac® Collection 1-Circuit straight push-in connector is perfect for residential or commercial use. Connector in white color, has tin-plated molded polycarbonate construction. It features fully polarized and grounded track system to ensure safe operation. 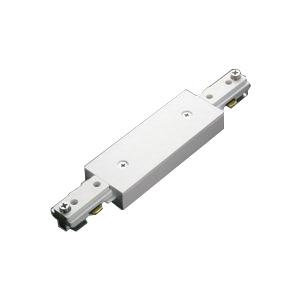 This connector has extruded aluminum channel with 0.06-Inch nominal wall thickness. It withstands current rating of 20-Amps. Connector has solid copper buss bars encased in rigid extruded PVC insulators. It provides end-to-end connection of two track sections. Connector is UL/cUL listed and CSA certified.